My last 10 orders have been in stock; acknowledged and shipped same day. Excellent customer service. Beth is a pleasure to work with. I am quite impressed with the new Ranger. The first feature that grabbed me was its smaller size and a rubber grip that favorably reminds of my Garmin GPS handheld. That was a great idea to include the integrated Rubber Boot, and I see that its design, with the U-shaped top face, anticipates the EXP probe cable connector. A well thought out Instrument Stand, too. I also like the addition of the uR/hr units, which at background levels, conveys the radiation level in familiar integers, but unlike the similar CPM, represents a standardized unit of measure. I haven’t studied the manual yet, but the new Interface is fairly intuitive, and the new Membrane Key Pad is physically easy to navigate with your thumb. That Control Panel is very eye-catching! The Display is much improved over that of the Inspector USB which had some issues. The characters are large and easy to read, especially with the 1 button Backlight feature if needed. On the other hand, apparently there is no Audio port for discrete earphone listening, a feature that would appeal to a minority of users, though. The USB is plug and play for transmission of radiation data to a PC with software, but I did notice that whenever I restart my software, that the USB connectivity is lost, so I need to unplug the cable and re-plug it back in. Maybe check for that anomaly in usage with the included Observer software. 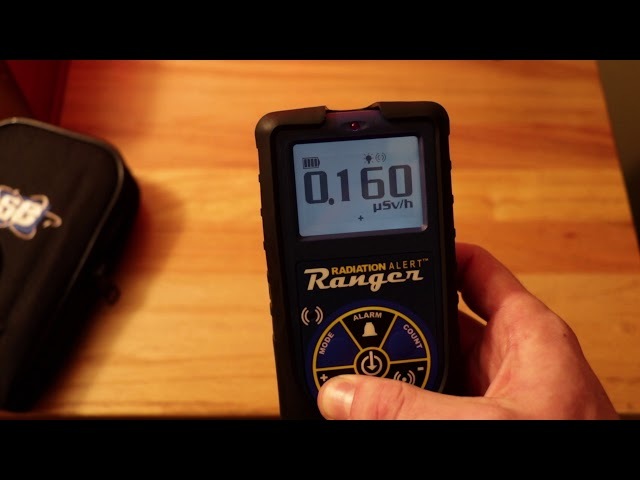 Since the Ranger has Internal Memory and Data Logging capability, a GPS chip to add associated location to radiation levels would seem a natural accompaniment, but I don’t believe there is one. In terms of packaging, I love that integrated boot so much that I am wondering if any carrying case in addition to that is even necessary? I probably would never use it. At most, you could offer a smaller version of your rain-resistant, yellow case, either included or optional. So I would ditch the old nylon zippered case, pre-install the batteries, _and_ the rubber surround, so that when your customer opens the box, the Ranger is already configured for immediate and likely mode of use (that would really make a great first impression!). I also believe in some sort of printed manual for a product that is both in this price range, and that needn’t be used with a computer, but I know your company wants to go “green”. Overall, I believe the Ranger is greatly improved over the Inspector USB – I think you have a real winner here. Good job! I greatly appreciate your exercise of superior customer service and demonstration of S.E.I.’s corporate good-will. Sending the cap gratis is an unexpected surprise for which I thank you greatly! You guys are great and you’ve all always been very helpful and open to assisting the hobbyist and volunteer. I remember back in 2012 that you made available to one of our online Geiger counter groups a great closeout of the RAP-47 scintillation probe at a great price. That was also appreciated by all who participated in the “group buy.” Thank you! Hope you guys like the video. Here are some specs of the Geiger counter.